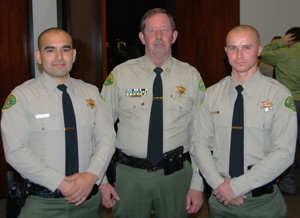 (Press Release) The Sheriff’s Office wants to congratulate Chris Hoodman and Brian Madera (both deputies at the Inyo County Sheriff’s Office) for recently graduating from Basic Peace Officer Academy (Class 192) in Riverside at the Ben Clark Training Facility on April 10th. Trainees undergo six months of training in laws of arrest, traffic accident investigations, criminal investigating, high speed defensive driving, firearms training, etc., all while maintaining a high level of physical agility and fitness. The course culminates with extensive testing. The graduating Basic Peace Officer Academy Class 192 consisted of 47 men and women. Brian Madera, a 2006 Bishop Union High School graduate, and Christopher Hoodman, a 2007 Bishop Union High School graduate, both started with the Department as Correctional Officers before deciding to pursue a career as an Inyo County Sheriff’s Deputy. The Sheriff’s Office also wants to recognize Brian Madera’s additional accolades from the Academy; Brian broke the Academy’s push-up record, and finished first overall in physical fitness! The Sheriff’s Office also wants to acknowledge Javier Nuñez, a long-time kitchen staff employee of the Inyo County Sheriff’s Office. Nuñez’s son (Javier Nuñez Jr.) graduated as well from the Basic Academy Class 192, and is currently a deputy with Riverside Sheriff’s Office. Good Job Madera and Hoodman, you both will be an outstanding addition to ICSO. From a retired Deputy Sheriff of 30 years, my congratulations to both of you…You are beginning the start of one of the most difficult, but yet many times rewarding careers. Always serve the citizens of Inyo County with the utmost in honesty and respect.. Always remember and never forget to watch a suspects hands, failure to do so can kill you….